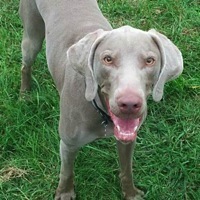 - Virginia Weimaraner Rescue - ADOPTIONS - Rescue Me! Bella Gray is a 1 year old female bully mix. She has gorgeous gray/brown brindle coloring with a white chest patch.